Am I Still My Brother's Keeper? Yes/No? You are here: Home / Health / Am I Still My Brother’s Keeper? Yes/No? 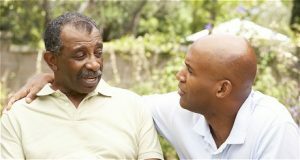 (ThyBlackMan.com) There is no more positive affirmation among African-American men than the following statement, “I am my Brother’s Keeper.” Within that five-word declarative sentence, one discovers an unyielding hope that as a collective, Black men will survive the torrential rain that has destroyed droves of their brethren. Unfortunately for righteous, collectivist-minded Black men interested in uplifting their “brothers”, the declaration of “I am my Brother’s Keeper” has become little more than opportunistic phraseology that allows some Black men to advance individual interests beneath a cloak of racial solidarity. I will be honest with you, the vast majority of African-American males in my circle harbor some “beef” with other Black males for reasons they cannot articulate. The alluded to anger is often articulated in the following manner, “there is just something that I don’t like about dude.” The inability to articulate black-on-black rage in no way lessens its existence. The wise among us realize that the unspoken hostility among Black men is one of the many costs of being socialized in a nation that maligns “blackness” on television, movies, school curriculums, popular culture, and the list goes on and on. There is no room to debate against the assertion that socialization facilitates much of the anger Black men express toward each other. It is this reality that raises one of the most important questions of “Am I, my brother’s keeper?” facing Black men at the present moment. Despite the compulsion of progressive Black men to answer this question affirmatively, the truth is that this matter should be answered on a case-by-case basis. Copious amounts of naïveté are required for any Black man to deny that our populace has been infiltrated by opportunists seeking to advance individual positions by any means necessary, including the exploitation of Black men, women, and children. Consider the irony contextualizing Tupac Amaru Shakur’s demise. It was Tupac who cryptically asserted the following in his timeless track Only God Can Judge Me. And they say that it’s the white man that I should fear. But it’s my own kind doing all the killing here. Black men who have chained themselves to an antiquated collectivist racial construct have to be reminded that their belief in racial solidarity is a value that not all “brothers” are governed by. Unfortunately for progressive-minded Black men, their continuing belief in a largely mythical past usually births a frightening and dangerous present. I am unashamed to reveal that caution and skepticism guide my current interactions with African-American males. Regardless of how hard I try, it is difficult to resist the caricature of Black males that can be directly traced to an extremely vocal and active minority of black males. With the benefit of hindsight, I have begun to view tales of a general brotherhood that glued black men together in past times as little more than a well-spun fable. In many ways, it does not matter if such times ever existed as the present crisis outweighs the past. It is this troubled past and convoluted present that leads me to the realization that I am not every black man’s keeper. Truthfully, few of them have behaved brotherly towards me. Unfortunately for Black America, it appears that the traditions that forged a collectivist racial identity are vanquished by a present pattern of deceit and betrayal. It is this undeniable reality that forces anyone possessing analytical skills to agree with Chuck D that “every brother ain’t a brother” and we must be cautious around our own kind.